I have emailed Gray over at JetLasers but am posting here with this question too because it sometimes takes a few days to hear back from him. I did a search on the forum but could not find an answer to my question. This is a picture that I made and sent to Gray to better explain my situation to him. I blurred out the model numbers of my lasers as that info is not important here (I requested a copy of the power graph charts which I thought would have been included with my package and he asked for my serial numbers). The problem I am having is the beam expander will not attach to my laser. Is there anyone here who owns a PL-E Pro laser and the Beam Expander who has run into this problem? I am wondering if I am missing a piece or if I am just misunderstanding how to attach everything. It seems as though the Adapter (A) is supposed to attach to the laser (B) where the lens cover would normally fit. The adapter would also be connected to the beam expander. (A) connects to (C) perfectly. 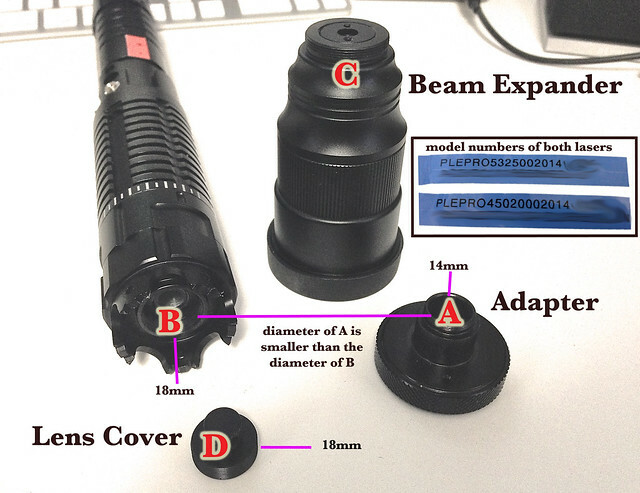 The diameter of the adapter (A) is smaller than the diameter on the laser (C). 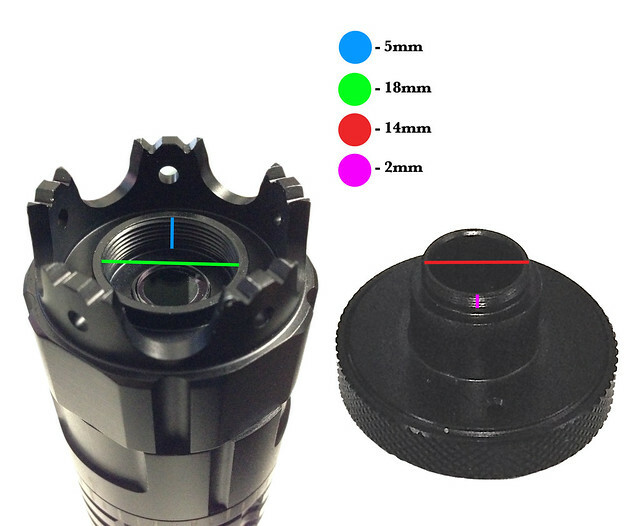 As you can see, the adapter diameter is 14mm and the area on the laser where you would screw it in is 18mm. Maybe they sent me the wrong size. I will hear back from Gray soon enough and will update you all when I do. PS: My unboxing picture set is almost complete and I will be sharing it with you all soon. Don't own one of those but from the looks of it they sent the wrong adapter. I own several beam expanders of another brand and have multiple adapters to fit different lasers and they resemble those closely. I can't see anything wrong with your adapter, here's a photo of mine assembled. Does yours screw right into where the lens cover screws in? If so, that is the problem with mine. I can't screw it in there because the diameter of the adapter is smaller than the ring around the lens. Hey PhillyAnt, you could try sending hakzaw1 a PM, he very well may be able to help you; he's worked with J/L and Gray for a long time. Yes, it screws in where the lens cover normally resides, I tried to get my adapter out, but it is stuck, without the right tools to grab that threaded piece and twist on it hard, I'll mar the aluminum now to take measurements. I was going to quote and respond to your second post, but it looks like you deleted it. You mentioned that it looked like I might not be pushing the adapter all the way in. Unfortunately that isn't the case. You can see from my picture that there just isn't anywhere else for me to push it. The gap going from the lens to the top thread (blue line) is 5mm. The threaded area on the adapter that would screw into it (purple) is only about 2mm. It is also only 14mm wide, where the area on the laser is 18mm wide. I am either missing a piece or they shipped me the wrong adapter. I know Gray will work it out but it kinda stinks not being able to try it out. I am going to dig through all of my packaging again to make sure I didn't miss anything. Yea, I deleted it because I could see the mismatch in size in the photo, I finally was able to remove my ring and it is indeed 18mm wide, so there was no change on the hosts interface, just gave you the wrong adapter as starlight reported. see how the pic alaskan posted is different than yours? Hey Shakenawake! Thanks for all the useful info on using the BE! I can't wait to try it out. I am still waiting to hear back from Gray. I will let you know about the adapter. I might take you up on that. Mine is actually 3 separate pieces. I took it apart and snapped a pic. It looks like it was the adapter used for the older models. 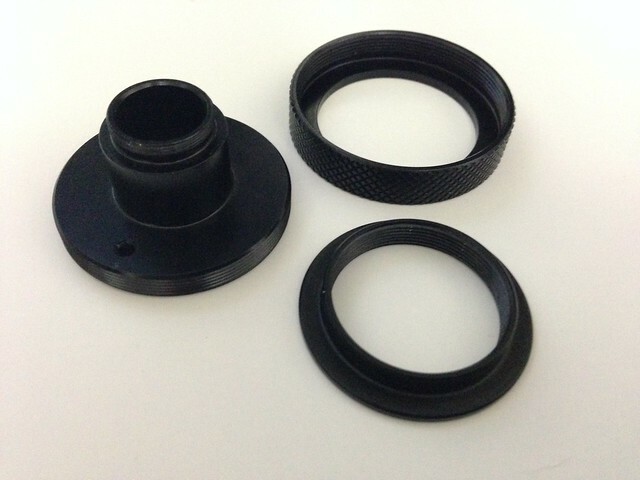 My adapter is three pieces total, as in your photo but with the 18mm wide threaded interface. When using it outside at night, the beam is more ribbon-like than a round beam, but still very bright and with a long travel at reduced divergence. I found it difficult to center the expander properly for max output, even outside at night. To get the beam centered correctly through the expander, since it is designed to slide around a bit on the head to find the center, before tightening, I'd use some goggles and shoot it at a wall to make sure the beam is in the middle of the lens, it can easily be cut in half if not centered properly and you really can't tell outside or without goggles to attenuate the brightness. In this photo, you can see a faint outline of the lens it shoots through. As soon as I got the first of those for Pro-PLEs I posted that the connection was too 'weak' and & unless we would be extremely careful stripped threads would result. NOt sure ATM whats up wih Gray and JL- been kinda 'off the radar' lately.. so take up Shaken on his offer & I will see that he gets a replacement asap. For what its worth the newer JL BEs ARE a BIG improvement from the first BEs that JL offered. Threaded IMO is the best of all ways..
are you going to want my extra adapter? Totally agree with you on the tripod hole. It is way too shallow for its purpose. These are heavy pieces. A sturdier attachment would ease my heart a little. I might end up using a clamp instead. I have a portable miniature vice grip that seems perfect for the job. I will include pics when I complete my review. I am just waiting for the adapter to arrive. Shakenawake, I apologize. I haven't been on the forums for a few days. Thank you for being so kind as to offer your adapter to me. Gray got back to me on the 10th and said he will be sending me out a new adapter. I have a tracking number now. I'm just waiting for it to show up on the DHL tracking list on their website. I am hoping to receive it this week. To comment back on what hakzaw1 said about Gray being off the radar lately, yes I feel that Gray is a little slow at getting back to me. He is a very kind person, but faster replies would just bring my rating of his service to the top tier. Maybe my expectations are too high? I just feel that solid fast communication goes a long way.